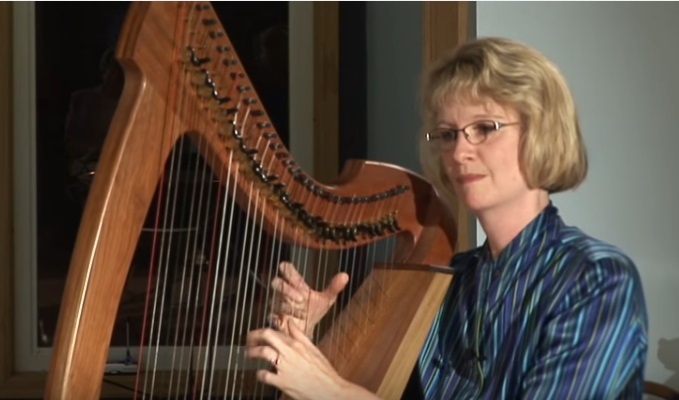 Tami Briggs has a certification in harp therapy from the International Harp Therapy Program. 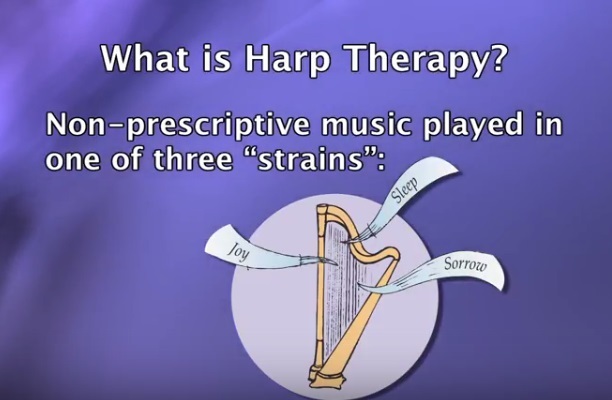 In these videos, she briefly introduces and demonstrates harp therapy. The Benefits of the Harp . . . In general, the benefits of music are well-documented in professional music therapy and medical journals. Although controlled studies are lacking, there is significant anecdotal evidence that suggests the human body responds favorably to harp music. Harp music . . . Creates a calming environment in homes and for hospital/hospice patients, families, visitors, and staff. Allows hospital patients and families to focus on something hopeful and beautiful to distract them from pain and suffering. Nurtures people in time of physical and/or emotional pain. Vibrates and penetrates body tissues and cells to facilitate healing. Provides palliative care for hospital and hospice patients in transition. Improves physiological effects, such as relaxed muscle tension, increased oxygenation, slower heart rate, lowered blood pressure, etc. The Healing Tradition of the Harp . . . The instrument’s archetypal significance as an ancient, spiritual healing instrument, which opens doors to the collective unconscious and, therefore, may facilitate the healing process. Its wide pitch range (low C-32.703 Hz to high G-3136.0 Hz), which can vibrate the entire body. Its varied and soothing palette of tone colors. The ethereal effect created through the harp’s unique glissando technique (utilizing enharmonic tones). The tension release associated with the emotional expression of plucking its strings, as Pythagoras suggested when he saw the strings as symbols of the nervous system. The instrument’s vibratory effect on the harpist’s body, especially the thymus gland, a major gland of the immune system located in the chest. Fabien Maman, French composer and musician, says in the Summer ’98 Harp Therapy Journal, “When natural acoustic instruments are played, their sound resonates with the corresponding element and organ in the body. Stringed instruments, for example, correspond to the energy of the heart, small intestine, pericardium, and Triple Warmer meridians. The fundamental note played on an acoustic instrument nurtures the physical body, while the overtones resonant in the subtle bodies. Comments from Clients . . .
Tami’s Beautiful Pedal Harp . . .
My musical journey began at age eight when I started taking piano lessons from Mrs. Willalee P. McKee. Mrs. McKee was a remarkable musician and shared her love of music with students who were willing to practice. I loved playing the piano and worked hard for her. A special bond formed between us. Mrs. McKee was also a painter of beautiful landscapes. One day, my mother and I visited her home to purchase a painting. In the quest to find the right one, we entered the living room. There stood an immense gold pedal harp, the first harp I had ever seen. Mrs. McKee played an enchanting melody for us, thereby “planting the seed.” Someday I too would play the harp. After just five years of lessons, my beloved piano teacher and I had a heartbreaking parting when Mrs. McKee moved from rural Missouri to Colorado. I eventually moved to Minnesota. On my thirtieth birthday, I gave myself a gift I had long wanted — harp lessons. My affinity for this instrument was present from the beginning. I completed three recordings on a folk harp (a smaller version of the pedal harp). After each recording was published, I sent a copy to Mrs. McKee. I enjoyed sharing my progress on the instrument we both loved the most! Two months after Mrs. McKee’s death, her beautiful instrument arrived at my door. Mrs. McKee is no longer on earth, but her spirit and presence grace my living room and playing every day. A beautiful gift . . . a musical and loving journey. Tami’s harp is a Lyon & Healy Gold Style 23. Photograph by permission Lyon & Healy. The more we cultivate great music in our lives, the greater will be our attunement to unlimited sources of the Creator’s power and direction.